Designed for light handling in cold conditions, the Honeywell Duro Task Sub-Zero Thermal Latex Palm-Coated Gloves NF14HD use a crinkle latex palm-coat and high dexterity to ensure grip and put you in control. A brushed acrylic liner offers excellent resistance to the cold, while strong tear resistance protects the hands against rough and coarse objects too. Where Can I Use the Honeywell Duro Task Sub-Zero Thermal Gloves? This list is just a list of recommended industries, and they aren't limited to just these tasks. These gloves offer excellent mechanical protection and good protection against the cold, while their flexible nature makes them well suited to a range of different tasks across industries that can range from outdoor yard work to tasks on the building site. What Will the Honeywell Duro Task Gloves Protect Me Against? The Honeywell Duro Task Gloves are well suited to use in cold conditions, with their thermal acrylic liner and crinkle latex coating offering enough warmth that the gloves will protect your hands at conditions around -15°C. Although they can be used in conditions colder than this, they may start to lose a level of their flexibility after a certain temperature drop. This is enough to use the gloves in most extreme weather events and in simulated environments such as cold stores. How Dexterous Are the Honeywell Sub-Zero Gloves? 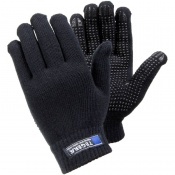 The Honeywell Sub-Zero Gloves are designed to be used for handling in cold temperatures. As a result they are highly dexterous, with their super thin 7 gauge liner offering enough dexterity to enable an outstanding hold on items in freezing conditions. This means that the chances of dropping items are reduced, while their Level 4 tear resistance will protect the hands against rough and coarse materials. Are the Honeywell Duro Task Gloves Suitable for Handling? The Honeywell Duro Task Sub-Zero Thermal Gloves are exceptional light handling gloves. Their latex palm coating is designed to offer outstanding grip, while dexterity and flexibility mean that you can handle items with ease. Both their grip and flexibility mean that handling materials is made easy, and the chances of dropping materials are reduced. What Key Features Do I Need to Know About the Honeywell Duro Task Gloves? 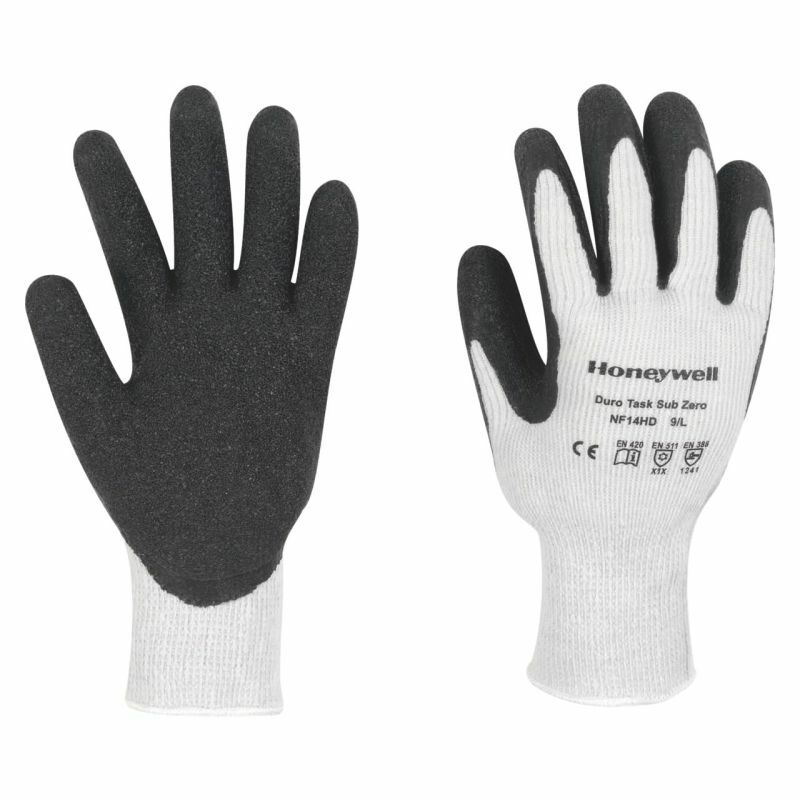 The Honeywell Gloves are available in three sizes that should be suitable for most users. To find your perfect pair, please measure the circumference and length of your palm and match the results to the table below. You might have noticed that this product adheres to EN standard EN 511. EN standards ensure that the product you are buying meets the safety standards of the European Committee for Standardization (CEN), the highest standards organisation recognised by and working on behalf of the European Union. To pass any EN standard, a PPE product must undergo some of the most rigorous safety tests around. 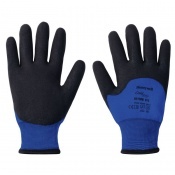 There are many EN standards that our gloves adhere to. However, the EN standard that we’re concerned about here is EN 511. EN 511 stands for all things cold, and means that your gloves have been tested for their convective cold resistance, contact cold resistance and water permeability properties. How Do I Read the EN 511 Score? Simply speaking, the higher the score achieved the better the product will be at resisting the hazard tested. For the first two tests (convective cold resistance and contact cold resistance), the product will achieve between a Level 0 and a Level 4. The higher the score the better the resistance, with a Level 0 score meaning that it failed and an N/A score meaning that the product wasn’t tested for this hazard. For water permeability the product will achieve either a Level 0 or a Level 1. Level 1 means that the product is waterproof, and Level 0 means that it isn't. This is just a brief overview of EN standard EN 511 so you know where you are standing. For further information, you can see the Introductory EN 511 Blog in our Knowledge Centre.